The merch company behind The Mighty Mighty Bosstones has a deal for you. Going on tour? In the market for some swag? 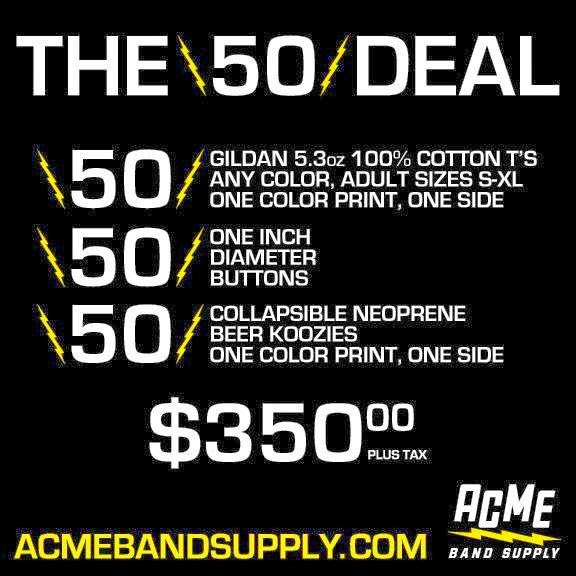 Check out ACME Band Supply’s 'The 50 Deal'. ACME’s ‘The 50 Deal’ is an ideal starter kit and includes 50 cotton Ts’, 50 one inch pins and 50 beer koozies for $350 plus tax. Spread the word about your band while making a profit with custom and professional merchandise. With over 15 years of experience in commercial printing, the Marshfield-based full service print shop is the merchandise mastermind behind notable acts like The Dropkick Murphys, The Mighty Mighty Bosstones, Big D and the Kids Table, Frank Turner and Less Than Jake, as well as yours truly. Take advantage of this limited time '50 Deal' offer and contact ACME at info@acmebandsupply.com today. For a complete list of print and design services, visit the official ACME Band Supply website and follow them on Facebook and Instagram for product shots.